Remote Viewing means splitting the consciousness and being aware of the simultaneous experiences your soul is having. 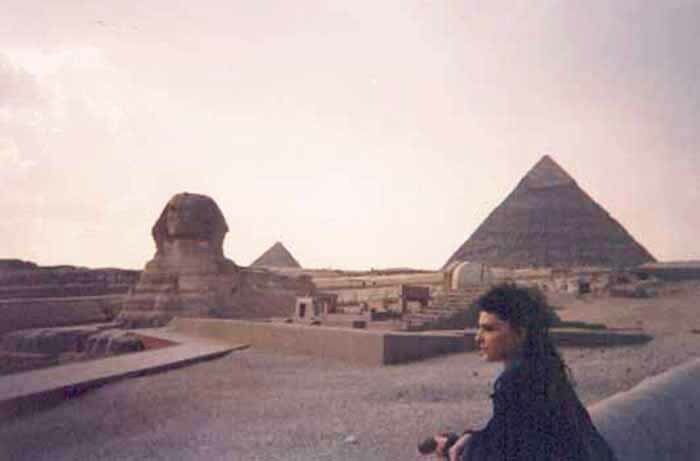 I have done many remote views in the Great Pyramid, while physically in the pyramid and on other locations. I do not necessarily agree with the author's findings below. Physically, if there is anything beneath the Sphinx or Great Pyramid, Zahi has removed it! Pravda News, April 2004, Psychic researcher uncovers the secrets of the Great Pyramid. A psychic researcher and a clairvoyant, author of The Book of Ahau disclosed his findings. A reader and writer with keen interest in the mysteries of the ancient world, Govany Perony opens a window into concealed reality via his mind in the form of extrasensory visions and archaeological research. His method, 'Remote Viewing' is the act of seeing without being present at the target site. He used this method to penetrate the inside of the Great Pyramid and see the secret chambers. In the Kings Chamber, behind the west wall is a mummy and offerings. Two pillars adorn the doorway and corridor. The entrance to the chamber is a small pivoting door at the bottom of the south west corner. The Coffer in the King Chamber serves as an opening mechanism. Ancients had to grab one corner and push, which is why we see it chipped on one side. Under the King Chamber there is a chamber with a structure that looks like the radiator of a car. Perhaps it was used to refine some kind of liquid. Most locks for these chambers are deep inside tunnels carved of the rock reachable only with telescoping staffs like the one Ptah is holding depicted in Egyptian history. The Gantenbrink door is a good example. Behind the west wall of the Queen Chamber lays also another chamber, only this time its full of thousands of rolls which the ancients have written. Underneath all this, deep beneath the Pyramid is a cylindrical room with a tall cylindrical object in the center that looks like a generator. The room walls are covered with a black insulating matter. There are no wires, hence the transmission was resonance or production of ions- Piezoelectric using the great pressure generated by millions of tons of the Pyramid. A tunnel connects this area with the Sphinx. There was never a top on the Great Pyramid. beneath the cover stones, on the top, a walkway or tunnel will be found. This tunnel which may have been built to transport the block of stones higher, spirals around the Pyramid all the way to the bottom. Under the Sphinx is an ancient museum that houses the remains of previous kings and written records of 'Man's history'. Previously it sat on a building painted in gold. The present-day floor of the Sphinx is false. Under it is a building. All these will be found intact once Egyptian authorities give permission to drill.